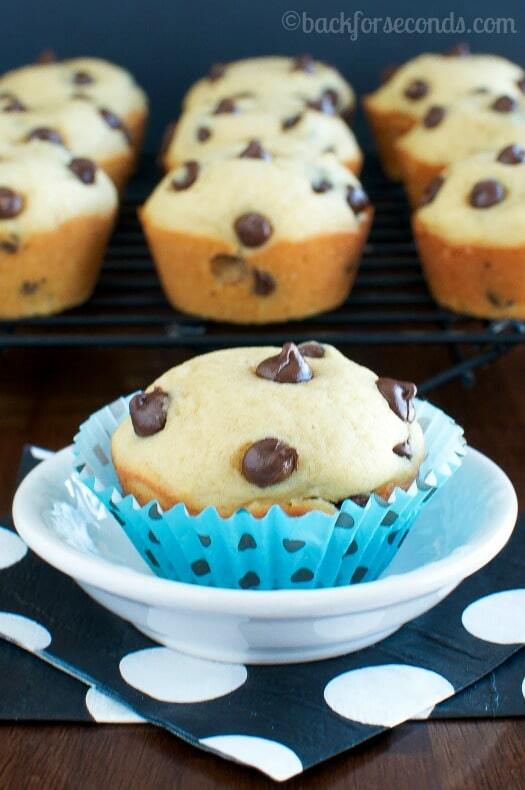 Light and Fluffy Chocolate Chip Muffins are perfect for breakfast, brunch, or a snack. 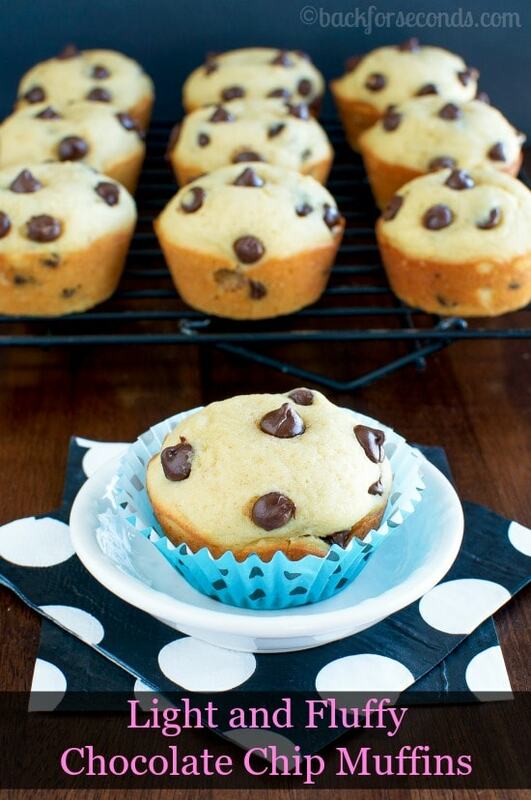 These are the best muffins, and they’re sure to become a favorite! 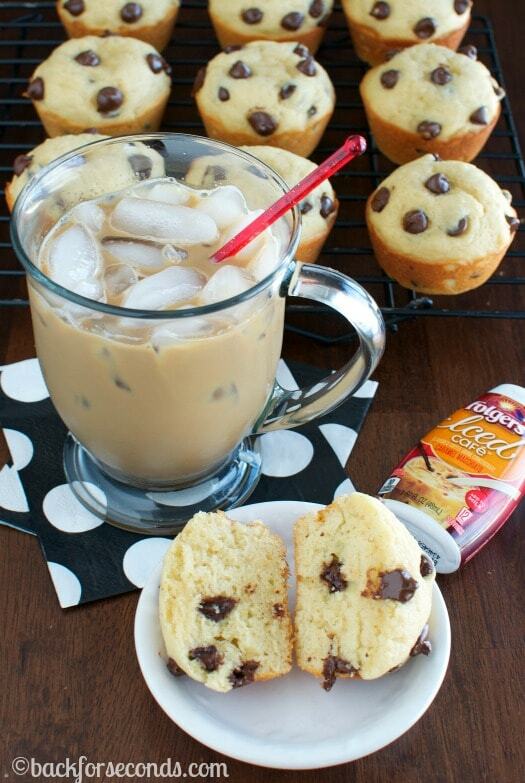 Try them with Folgers® Iced Café for the full coffee house experience! 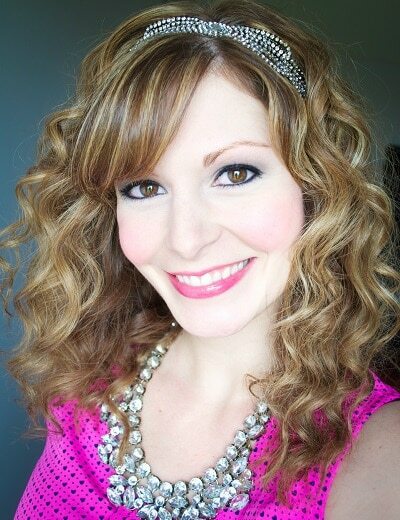 This is a sponsored post for Folgers® and Socialstars #MyIcedCafe however, all opinions and text are my own. Do you like to head to your nearby coffee shop to grab a quick breakfast or afternoon snack on busy days? It’s hard to resist those yummy pastries and muffins, and the fancy shmancy coffee drinks aren’t too shabby either. It’s not hard for me to resist paying $7.50 for a muffin and coffee all the time, though, am I right? 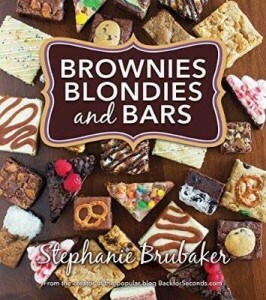 Plus, with 4 small children, it’s easier (not to mention, much faster) to stay home and make my own coffee house goodies! It’s much more fun this way, too! The kids can get involved and choose what kind of muffins to make, and we can bake up a whole batch for about the same price as a single muffin would have cost! Of course, I still like to have my jazzed up coffee drinks, even when I’m just staying home. 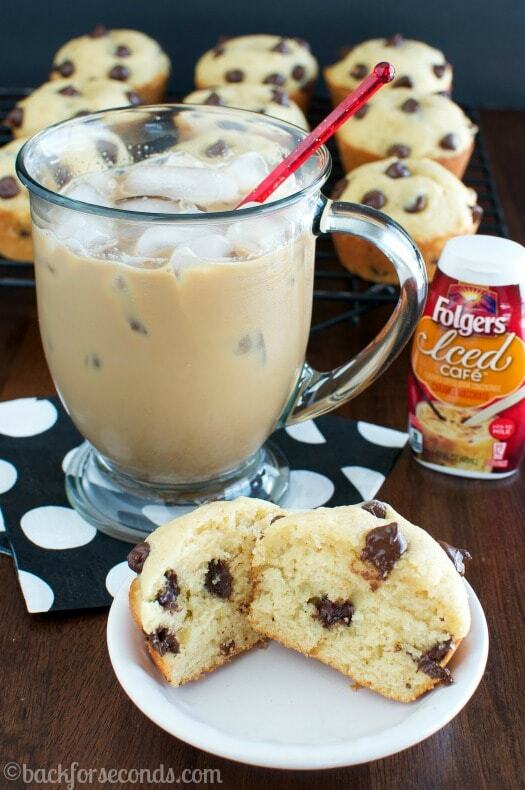 The new Folgers® Iced Café drinks are so great because all you need is a cup of ice cold milk! They come in 4 flavors: Hazelnut Latte, Vanilla Latte, Original Late, and my favorite – Caramel Macchiato! You can even get a little crazy and mix the flavors for an even more customizable drink! The bottles are small and portable, and they do not need to be refrigerated, so you can keep them with you wherever you go in case the iced coffee mood strikes! I like to fill a glass (or a tumbler if I’m running out the door) with ice and then fill with a cup of milk. Then just choose the flavor that strikes my fancy that day, and add it right in and stir! That’s it! These are made from Mountain Grown beans, the world’s richest and most aromatic, so you know this is the good stuff. 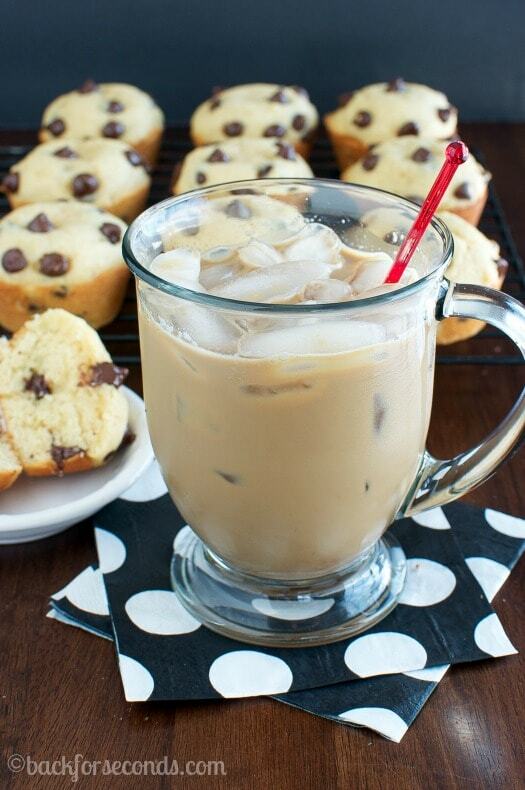 I enjoyed my Iced Café while my family and I ate these Light and Fluffy Chocolate Chip Muffins fresh from the oven. 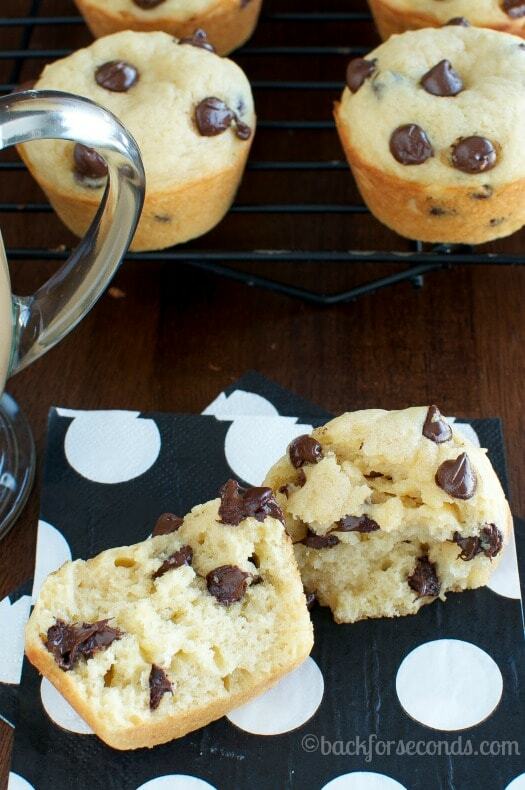 The texture of these muffins just can’t be beat, and who can resist all those pockets of melted chocolate?! The yogurt in this recipe keeps these muffins perfectly moist. Mmmmmm. If you are looking for the perfect muffin for breakfast, or brunch, or an afternoon snack, look no further! These are the BEST! Be sure to visit Folgers® on Facebook and Twitter to keep up with the latest products! I will definitely try this recipe again but, it’s missing salt! I think it needs probably a 1/2 tsp. of salt to make them have a better flavor. Nice light fluffy texture otherwise. These are absolutely delicious, although I thought the yogurt taste was very strong. Also, my muffins took longer than 13-15 minutes to cook. Loved them overall though!